If you live or work in California, you’re lucky! California has arguably the most pro-worker employment laws in the country. Workers are entitled to numerous rights and protections under California labor law, and can recover large penalties if employers violate those rights. Employers also cannot force you to waive your right to the protections of California labor law. A recent amendment to the California labor code says that an employment agreement cannot force a California worker to accept the labor laws of a different state. Employers sometimes slip a “choice-of-law” provision in their contracts that says the labor laws of the employer’s home state will govern the employment relationship, but CA considers these contract provisions invalid. California 4-Hour Minimum Shift California labor law requires that employees who work regular 8-hour shifts be paid for a minimum of four hours if they are sent home early, or have to check in every day to see if they are scheduled. California Independent Contractor Law Employers sometimes misclassify workers as “independent contractors” rather than “employees.” Incorrect classification can keep workers from getting their full rights under the law. Workers can recover labor code penalties of up to $25,000 per violation if they are misclassified. 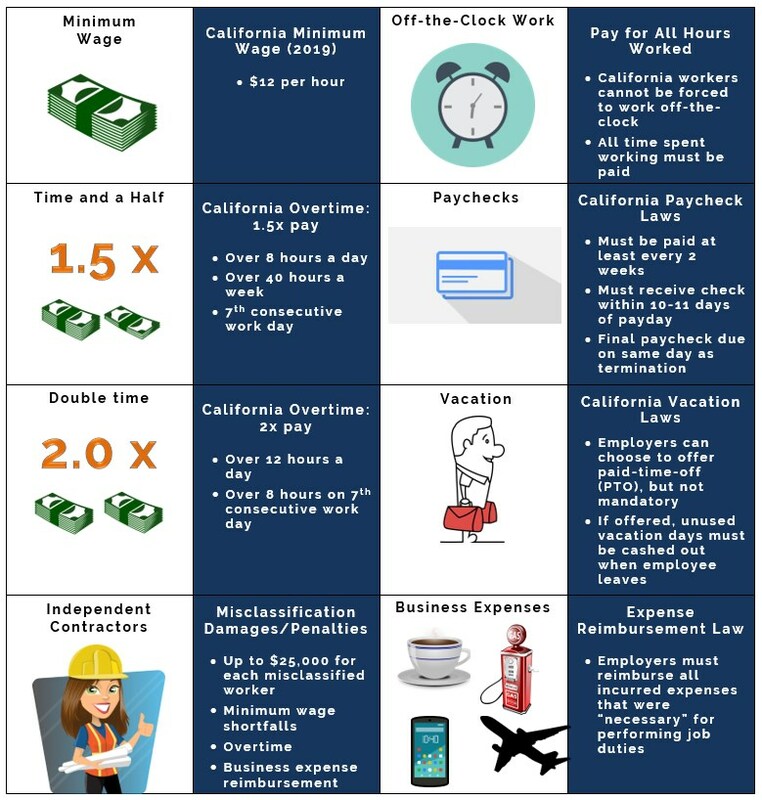 California Overtime Law Under California labor law, non-exempt employees are entitled to 1.5x their regular pay for hours worked beyond 8 per day (or 40 per week) and 2x their regular rate for hours worked beyond 12 per day. There are also other scenarios where workers are entitled to overtime in California. California Minimum Wage Law The minimum wage in California for 2019 is $12 per hour. All non-exempt employees in California are entitled to a guarantee that they will be paid at least this much for every hour they spend “on the clock.” Some local areas in California have even higher minimum wages. California Exempt Employee Law The California labor code, by default, gives all employees a right to minimum wage and overtime, but some types of salaried employees are considered exempt. Read more about which workers are exempt from California minimum wage and overtime requirements. California Vacation Pay Law If an employer has vacation pay benefits (also known as paid-time-off), California labor law says those vacation days never expire and can be cashed out if an employee leaves or gets fired. California WARN Act: Layoffs If an employer lays off 50 or more workers in a one-month period, or closes down a store, or relocates, the California labor code requires they give 60-days’ advance notice. If they don’t, workers are entitled to two months’ pay and benefits. California Final Paycheck Law If you’re fired, you must be paid your last check that same day. If you quit, your employer has 72 hours to give you a final check. California Off-the-Clock Work Law If you are forced to work off-the-clock or your employer knows or should know you are voluntarily working off-the-clock, you are entitled to be paid for those unclocked hours. California Paystub Law If you’re not given paystubs, you can recover penalties up to $4,000 under the California labor code. California Meal and Rest Break Law If you’re not given breaks at the appropriate times, you can collect penalties of 2-hours’ pay for each day you weren’t given a proper meal and rest break. Generally, California labor law is more pro-worker. And typically, the damages and penalties a worker can recover are higher under California labor law than under federal labor law. Learn more about the differences between California and federal labor laws. An employment-law litigator with over 20 years’ experience, Steven Tindall is well-acquainted with litigating under California labor law. His largest recovery in a single employment case is $29 million. 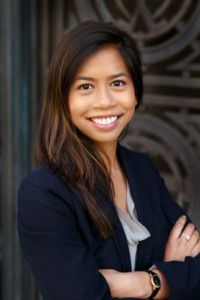 Prior to joining us at Gibbs Law Group LLP, Linda Lam worked at a national employment law firm, where she represented workers in lawsuits to recover unpaid wages and benefits. 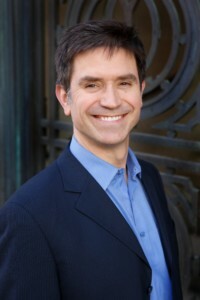 Steve has prosecuted a variety of complex employment cases involving California labor law. He is fluent in English and Spanish. Our California employment attorneys – with over 50 years of collective experience litigating under California employment law – know how to fight for employees’ rights and get them the money they deserve. We’ve recovered tens of millions of dollars for California employees and represent individuals as well as class actions in virtually every area of California employment and labor laws: California overtime law, off the clock violations in CA, breach of contract disputes, California independent contractor law, sexual harassment, employee misclassification, discrimination, as well as mass layoffs in violation of the California WARN Act. 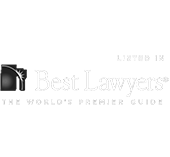 Our California employment lawyers are repeatedly recognized for their expertise litigating in California. 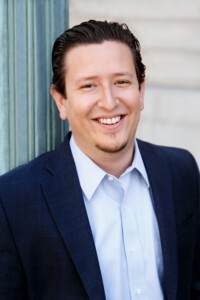 Founding partner Eric Gibbs has been selected as one of the Top Plaintiff Lawyers in California. And seventeen of the firm’s attorneys were selected as Northern California Super Lawyers and Rising Stars, a distinction received by less than 5% of attorneys in Northern California. If you believe your employer has violated California labor law, one of our Oakland-based California employment attorneys can provide a free case evaluation and estimate your damages. Call or message us. No costs or obligations.